﻿ We Compare KitchenAid Stand Mixers: Which Is The Best? This page is a time-saving one-stop place for you to compare KitchenAid mixers. Find all models here with their features, costs and benefits. Plus, key points to consider when choosing. After having dug through the maze of information, read hundreds of reviews, contacted the manufacturer, bought and used this brand; we don’t want to leave the pieces just lying around. We heard you and others like you who either seek clarification or are still confused. So, we pieced everything together in this most detailed KitchenAid mixers comparison. You won’t find anything like this on the web. Firstly, have a look through the KitchenAid stand mixer comparison chart that includes the model you are considering. If you don’t yet have a clear choice, don’t worry. You will find all KitchenAid mixer models in the charts below. Charts are great if you want to make a quick assessment at a glance because they are clear, easy to understand and you can compare features side-by-side. But, what do the data there mean to me? We hear you. We’re still with you. We take a closer look at some essential factors which you need to consider. Each factor shall highlight a difference between KitchenAid mixers and shall explain how or why it makes one model better. If you want our detailed full review of a certain model, we point you to it. Where needed, we will recommend articles on this site which you should read. Cost is an important consideration when deciding which counter top mixer to buy. Approximate costs are included in the tables and we let you know where you can find the lowest cost. How Are KitchenAid Stand Mixers Classified? Models designed for the home are either a tilt head or a bowl lift. These mechanisms are useful for when you need space to scrape content or to manipulate accessories. Smaller and less powerful models are most often “tilt heads”; whereas the more powerful ones with their bigger motors are “bowl lifts”. This article which compares a bowl lift vs a tilt head will help you determine which type you prefer. As we go along, we shall follow the above classifications for clearer presentation and better understanding. Residential models are designed for preparing food for your family and friends. Some people use the bigger and more powerful models for their home-based businesses. Take note that warranty is voided if you use them for commercial purposes, home-based or not, even if you only produce small quantities. Lifting the motor head at an angle provides space to mix manually, scrape content or detach or attach accessories. A pin locks or unlocks the head of KitchenAid tilt head models to the stand. Table 1 displays all tilt head mixers from KitchenAid. Click on the hyperlinked model names to read full reviews. Go further down for brief descriptions of each model. The Classic is KitchenAid’s entry level stand mixer. It has the least power. This suits the beginner, the hobby baker or one who is just starting a family. It is not recommended for bread. Although you might get away with very rare bread making. The Classic Plus is almost the same price as the Classic. But it is more capable of kneading bread dough, although only 1 loaf at a time. At most 2 loaves and not daily. If I want a cheap small KitchenAid I’d pick the Classic Plus over the Classic. The Ultrapower and the Classic Plus perform almost the same. If I want a tilt-head that can make more bread than the Classic Plus, I’d pick the cheapest Artisan over an Ultrapower. The Artisan is slightly more expensive, but it is better for bread dough. The Artisan mixer with its 5-quart bowl and 325 watts power can be used for bread making more often, but not daily. Once or twice a week and 2 to 3 loaves at a time is ideal. The KitchenAid Ksm150 Artisan is the most popular stand mixer in the market for years now. It meets the needs of most families, and is up to the challenge of holiday baking. The Artisan Design Series has a glass bowl with graduations. Aside from being elegant, its other benefit over stainless steel bowls is that you can easily see if there are unmixed ingredients at the bottom. But a glass bowl is not for someone with weak arms or hands because it is heavy. This type has a fixed head that keeps it steady. A crank lever raises and lowers the bowl providing space to access contents and accessories. We can further classify bowl lift models as to their motor type: AC or DC. You might wonder what’s with an AC or DC motor? Why does it matter? DC motor stand mixers are rated in “horsepower (hp)”, AC motors are rated in watts. DC motors are bigger and heavier. The most crucial difference is that DC motors are excellent at maintaining consistent speed. It does not stall even as the load gets denser or stiffer. As a result, it runs smoothly, is quieter and does not jerk. Therefore, it is better able to tackle tougher mixing and kneading than AC motors. A DC motor also provides greater amount of torque which is the twisting force which moves mixture around. Greater torque is excellent for stiff mixtures like bread, pizza and cookie dough. See this post which compares benefits and setbacks of each motor type. All are equipped with Soft Start feature, Motor Protection and Electronic Speed sensor. The tilt-head models don’t have these features. Soft Start feature starts the mixer slowly even if you accidentally set it on a higher speed at the start. This is important because it prevents splatters and flour cloud which reduces the mess you’d have to clean up. Motor Protection shuts off the motor when it becomes overloaded. Some folks get annoyed when this happens. But, it essentially prevents your mixer from going bust which results from overworking the motor. Electronc Speed Sensor runs the mixer at a consistent speed for proper mixing and dough formation. The Professional 5 Plus is in the price level of the tilt-head Artisan, but has 125 watts more power making it superior for difficult dough. The Design Series models have glass bowls with graduations and F-series coated beater and dough hook. A glass bowl is elegant but also heavier which may not suit those with weak hands and arms. KitchenAid’s proprietary F-series coating does not chip like nylon-coating or oxidizes like burnished metal. The Professional 620 has metallic finishes. It is similar to the tilt-head custom metallic model. 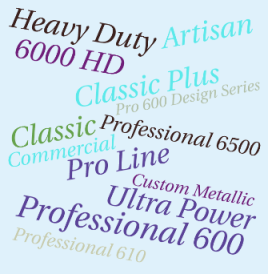 The Pro 6000 Heavy Duty, Pro 6500 Design and the Pro Line have powerful DC motors. The Pro Line series comes with a 5-year warranty compared to 1 year for the rest. That is how confident KitchenAid is with the Pro Line. 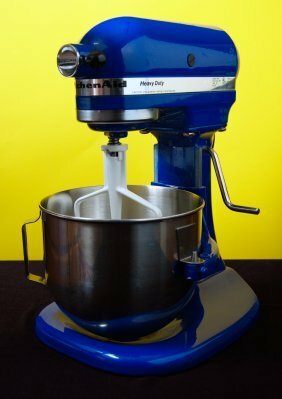 What KitchenAid Mixers Are Made For Commercial Use? Stainless steel accessories: flat beater, spiral dough hook and 11-wire elliptical whip. The bowls are interchangeable. However, the 8-quart model is taller and there is more space between the head and the bowl. Hence, the clearance is reduced if you use an 8-quart bowl on the 7-quart model. 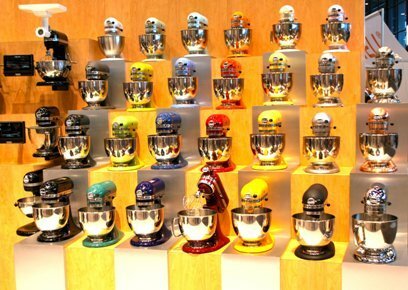 What Are The Available KitchenAid Mixer Colors? One of the big selling point of a Kitchen Aid stand mixer is the wide array of lovely delectable sounding colors. However, this is not true for all models. Most are available in only 3 – 5 shades. The Artisan series with 40 gorgeous shades is on top, followed by the Professional 600 with 24. The Artisan Design series comes in 13 different vivid and glossy shades. The most common colors across all models are: Empire Red, Black and White. A pink KitchenAid mixer is the most sought after. So is a red one. Other popular shades are: green, yellow, ice blue, cobalt blue, teal, pistachio, purple and cranberry. Is There A Refurbished KitchenAid Mixer? Walmart, Amazon and KitchenAid offer refurbished units from time to time. You have to be patient and check back often to get a reconditioned model you want. Refurbished units undergo strict testing and quality control before they are certified by KitchenAid. You can save anywhere from 25% to 40% on a reconditioned unit. Check this refurbished KitchenAid mixer models on Amazon. Cost will be a big factor in picking a stand alone mixer from this popular brand because it is a substantial investment. You will want to find a KitchenAid outlet that offers the lowest prices. Check Walmart for price cuts they call “rollback”, especially during sale events. Amazon often offers reduced prices. Firstly, I will be forced to purchase items from the store even if they sell at higher prices than in other stores. Secondly, I will be forced to buy things I don’t need just so I can use the store cash or the discount. Thirdly, some or most of us have a budget, we don’t wanna spend now on things we may need later via store cash or discount privileges. I prefer to hold any savings I can get in “cold cash”. That way I have control over what to do with what I’m able to save. Ready to buy a KitchenAid mixer? Go back to the Tables and click on your preference to see product details. Which KitchenAid Mixer Is Best? We come to the point of determining which really is the best KitchenAid stand mixer. There is no single criteria because almost all the time it will depend on one’s needs, preferences and budget. But, from extensive research, there are indeed certain models that perform better and are more efficient. The hobby or beginner baker will pick the Classic. It’s 4.5 quart capacity is just right. The Artisan series is ideal for most household needs including Holiday baking. It can cater to a family of 4-6. Plus, you can make bread infrequently (once or twice a week) with it. If you are more than 6 in the family and would like to be able to make bread daily, consider a Professional 600 or a Professional 6000 HD. They have bigger capacity and higher power than the 5-quart models. The Pro Line series works well for both small and big quantities. If the 7-quart bowl is too big for you, 3-quart and 5-quart bowls are also available. The Pro line offers more leeway with it’s powerful DC motor. If bread making is your primary use of a stand mixer, this is the wisest choice for home use. A cheaper DC motor mixer is the Professional 6000 HD. And, its 6-quart bowl and 1 hp motor is not an overkill for those who don’t prepare big amounts. If business is your primary purpose, get a commercial model. KitchenAid stand mixers for the home, except those with DC motors, have almost the same issues. If you read online discussions about which KitchenAid standing mixer is good, you’ll notice that most revolve around the capacity for handling heavy dough. Now, why do some people claim that a certain model is good for bread, while others complain. Most likely it’s because several factors affect dough consistency. Protein content, baker’s percentage, humidity, other ingredients (nuts, grains, etc. ), volume, speed and time will determine how difficult a mixture is. Whatever your considerations are when weighing which KitchenAid stand mixer is for you, it is worth taking note that it’s better to have excess capability now than need more later and not have it.